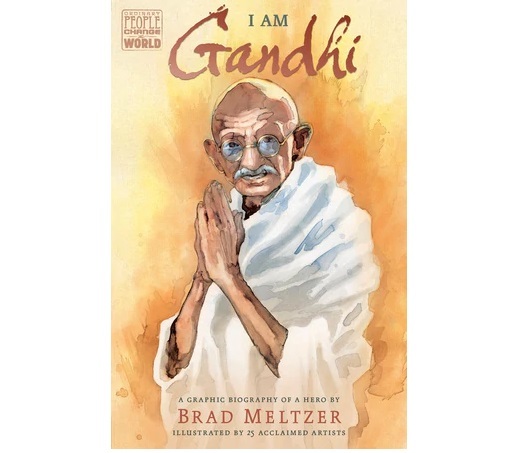 According to The Statesman, the latest graphic novel from Brad Meltzer about Gandhi will hit the stores across the world on May 2018 and the book will be published by Dial Books. The graphical novel of Gandhi has illustrations done by over two dozen popular artists. The launch date of the graphic novel on Gandhi has been announced just two months after Meltzer published a children’s book on Gandhi titled ‘I Am Gandhi,’ which was intended for giving the students a glimpse about the father of India who used nonviolence as the method to liberate India, which was enslaved by the British till 1947. “I gave the script of it to my 15-year-old son. I just wanted him to hear the message. As he was reading, I was reading over his shoulder. And then it hit me: I needed Gandhi’s lessons as much as he did,” Meltzer told The Washington Post. Once Meltzer decided that his next big project would be a graphic novel on Mahatma Gandhi, he contacted his former colleagues from DC comic books, Gene Ha, Rags Morales and Bryan Hitch, to further discuss the possibilities of the novel. Meltzer’s idea got support from the artistic community and big names such as Dan DiDio, Brian Michael Bendis, Marc Andreyko and Tom Brevoort helped him in completing the novel. Successful artists such as Amanda Conner, Siddharth Kotian, and David Marquez, as well as ‘March’s’ Nate Powell offered their brilliance at no cost. The top artistic slate also includes Art Adams, John Cassaday, Carlos D’Anda, Michael Gaydos, Stephanie Hans, Phil Jimenez, David LaFuente, David Mack, Alex Maleev, Francis Manapul, Steve McNiven, Saumin Patel, Stephane Roux, Marco Rudy, Kamome Shirahama, Bill Sienkiewicz and Abhishek Singh. “We get to put Gandhi’s message into the world. As I told my son that first night: ‘No one wins in a fight.’ Right now, the world needs to hear that. We need more love in the world and less hate,” he added. According to Brad Meltzer, the royalties gained from the novel will be donated to Seeds of Peace, a nonprofit group that focuses on personal transformation and then wider societal change. This is wonderful! I hope this will inspire more and more people to take to Gandhian way.